Ed. note: This edition of Kellogg World focuses on the Kellogg School's student culture as viewed through the lens of the Full-Time Program. While equally strong cultures exist in both the Part-Time and Executive MBA programs, telling those stories properly demands sufficient and distinct space, which will be allotted to both programs in the summer and winter editions of this magazine. "Look at that," says Ed Wilson, flipping past a yellowed page with maybe a dozen faces. "The entire administration is right there." In Wilson's office, a sort of unofficial archive for the Kellogg School, the associate dean emeritus for master's degree programs and student affairs holds a booklet dating from 1976, four years after he arrived at what was then called the Graduate School of Management at Northwestern University. In perhaps 40 narrow pages the school's story is sketched out, its faculty and staff named and pictured, its students displayed — about 400 of them, some sporting chunky-framed glasses and sideburns, others with hair cropped more conservatively. One quarter are women, an enormous jump from a couple years earlier when just 5 percent enrolled. Nearly half come from the Midwest. Three decades later, Wilson beams remembering the close-knit team that he says worked tirelessly to elevate the school through aggressive student and faculty recruiting. It was also a time of curriculum enhancements that, in the shadows of Vietnam, extended the frameworks for what management could accomplish in the corporate world and beyond, venturing into the nonprofit and public sectors and appealing to a new generation of students suspicious of business-as-usual. Today, Wilson remains proud of what that lean but dedicated staff could accomplish. "We were one-deep. I was dean of admissions and didn't have a full-time assistant," he says. Any hint of complaint is immediately swept aside by his obvious affection for Kellogg. "It was enormously satisfying, but I can't tell you how many hours we worked. We were happy, though, because we believed our efforts were making a noble contribution to a fine institution." If the staff was limited, its aspirations were not. What's more, far from being a liability, the slim administration inspired a fruitful partnership with students that became the cornerstone of Kellogg School culture, giving rise to a host of initiatives that have created extraordinary leadership and learning opportunities. "It is our view that students are partners with us on the journey," says Dean Dipak C. Jain. "We engage their ideas and talents to bring vibrancy to the Kellogg culture. 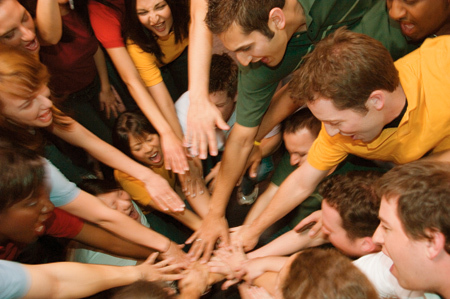 By encouraging them to participate in all areas of the school — including roles in the recruiting and interviewing of new students — we create real opportunities for them to develop and test their leadership skills, and we invite them, as alumni, to remain connected with us as partners for their entire lives." One of the students who understood the partnership model early was Mary Corbitt Clark. At the time she began her business education in 1973, Tony Orlando and Dawn's "Tie a Yellow Ribbon" was an AM radio hit, the sci-fi thriller "Soylent Green" was making people wonder about what was really in that sandwich, and the OPEC oil crisis hit, quadrupling the price of oil and nearly doubling U.S. gasoline prices. Tuition at the School of Management stood at $900 per quarter. Little did Clark realize that when she walked into the school another decade would pass before she would leave, despite earning her degree in 1975. 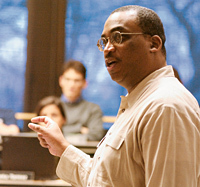 "When I arrived, I also began a professional association with the school, working as the graduate assistant in the admissions office," says Clark, who today is executive director of Winning Workplaces, an Evanston-based nonprofit whose mission is to help small and mid-sized organizations create productive work environments. "From the beginning, I was treated as a colleague." From student to staff: Mary Corbitt Clark, left, began her Kellogg education in 1973, going on to become the school's admissions director. 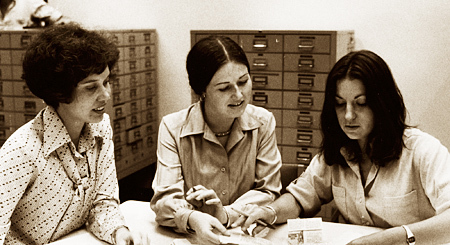 With her in this 1978 photo are, from center, Kathleen Gwynn, assistant director of admissions, and Scarlett Stewart '79, graduate assistant. She would go on to become admissions director when Wilson moved to take a new position as associate dean for student affairs in 1977. "I accepted the full-time position in the admissions office because I believed it offered an opportunity to assume a good deal of responsibility quickly and have an impact on the school's development," says Clark. "Both of those things were true." "Early in my Kellogg experience there was little in the way of student activities," Clark remembers. Occasional parties sponsored by the Graduate Management Association* (GMA) punctuated an otherwise informal social life at the school, she says. Soon, though, students approached the administration with ideas to augment the classroom lessons. "Students were interested in enriching their experience, and many looked for extracurricular and volunteer activities," says Clark. "Bright, creative students had many good ideas, and when they were willing to work to turn those ideas into reality, there was endorsement and support from the school." Because resources were scarce, the school challenged students to take the lead on endeavors they petitioned for, including a student newspaper, a yearbook, the weekly social event known as TG, and a convocation ceremony (the first, in 1978, featured Karl D. Bays, chairman of American Hospital Supply Corp. and chair of the school's advisory council, addressing graduates and cautioning them about pitfalls of competition, encouraging instead collaborative learning). The message from the school? Students could have it all, as long as they made it happen and obtained the administration's blessing. "We weren't exploiting the students; we were giving them practical leadership experience," says Donald P. Jacobs, who served as Kellogg School dean from 1975 until 2001. "It broadened their education, and a lot of the esprit around here comes from the fact that the students are part of the culture. It has changed the way the place feels and acts." Present early in the effort to increase student interaction, Fred Hundt recalls how he and the GMA instituted "TG." The Class of 1979 graduate and GMA president says he and his peers also collaborated with the administration to create a student newspaper and the first points-based course bidding system. In all these initiatives, Hundt says the school's leadership proved "supportive and very approachable." How has the Kellogg School changed in the last 30 years? Compare the stats in "Then and now — by the numbers"
Still, he remembers being nervous about bringing TG to Northwestern, particularly since Evanston at that time prohibited alcohol sales. "The afternoon of the first TG there was a lot of apprehension about the administration's reaction," says Hundt. "I remember the hush in the student lounge when Dean Jacobs strode in. He walked up to me and asked, 'Fred, where can a man get a beer around here?'" The dean's participation and the administration's support were critical to the success of this now-legendary Kellogg touchstone, says Hundt. Student passion for academic content also inspired continuous innovation at the school. Over time, clubs and conferences grew in number and prominence. Students pushed for offerings such as Global Initiatives in Management (GIM), as well as cultural staples, such as the theatrical revue, Special K!. With GIM and Tech Venture, courses that include intensive field excursions to business and technology hubs around the world, students have produced research, working closely with faculty to co-create knowledge that has been published in texts, such as Kellogg on Innovation & Technology and Kellogg on Global Issues in Management. This ability to "dig deeper," in the words of Dean Jain, is one way students create real intellectual value, adding their ideas to important academic discourse. For Fran Brasfield Langewisch, it is this spirit of innovation that she says helps drive "continual improvement" at Kellogg. "Their passion for the school and its culture is the most important element that students bring to the table," says the assistant dean and director of student life and experiences. For real innovation to work, though, demands commitment from all participants — a quality that is integral to the school's team-oriented culture. "In the interactions between students and the administration, we were all aware that Kellogg was a really special place because of its people," says Tim Hennessey '87, who served as GMA president. "Everyone was accessible, friendly and willing to work. Kellogg was the first business school to recognize these talents as vital to successful leaders, and it identified and cultivated these talents in the student pool." Next page: "Enduring culture unites past and current students"